Polystyrene is a toxic plastic and can be found in both foam and solid versions. Not all polystyrene plastics are in the form of foam. When talking about polystyrene, most people think of the white polystyrene foam packaging you find when unpacking that new coffee maker or TV. Or the foam trays in supermarkets, when you’re buying meat or vegetables. But polystyrene isn’t always manufactured as a foam. It can also be made into a clear or colored plastic. For example, the water reservoir on one of my old coffee makers was clear plastic...but it was polystyrene, marked with the recycling #6. This kind of solid polystyrene is also used in some food packaging. 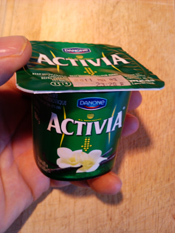 For example, the yogurt cup pictured above is made of polystyrene. This is not good, because polystyrene contains styrene, also known as vinyl benzene. The US Environmental Protection Agency has described styrene as "a suspected carcinogen" and "a suspected toxin to the gastrointestinal, kidney, and respiratory systems, among others." In other words, you should avoid foods and beverages which are stored in polystyrene, whether it be the foam or hard type. It means not drinking coffee from polystyrene cups. It means you should absolutely not store leftovers in polystyrene containers - Chinese takeout , anyone? – and you should never, ever reheat food in any kind of polystyrene container. And remember, just because a plastic doesn’t look like polystyrene, doesn’t mean that it isn’t. Always check the #6 recycling number.